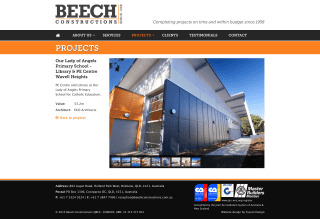 Beech Constructions is a Brisbane-based construction company with a long-term reputation and proven track record for providing cost-effective quality products. They had an existing website built with ExpressionEngine, but they didn't like the design, it had a number of display problems with different results in different browsers, and wasn't as easy to update as they would've liked. 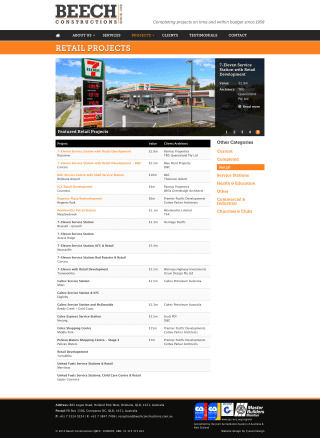 I gave the site a clean, simple design that fitted more tightly with the company's branding and made good use of images showcasing the company's outstanding work. 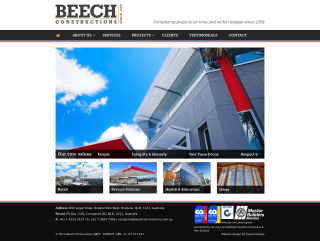 Their CMS was upgraded and enhanced with new features which made updating content easier, particularly the handling of multiple images for the different project entries. Great work John. We really enjoyed the experience of working you to recreate our website and have no hesitation in recommending you to others.